This should surprise no one. Bose has made a reputation for itself as a manufacturer of premium audio equipment, kind of the analogous to the position Apple occupies in the computer world. This means the stuff is not only good, it's also a tad pricey compared to some of the competition, but in both Apple's and Bose's case, that premium means (at least so far!) you can be confident you're buying something good, and that will last. So it is for these new SoundTrue headphones - at least as far as the "around-ear" ones Bose sent me for review. They don't cancel noise, but they sound great and they're nice and light and very comfortable on the head. For what more could anyone ask? Heck, they even come with a nice carrying case. Well, they could be wireless, which these ones aren't, but one of the reasons for leaving a connecting cord is to have a place where they can mount a microphone that lets the user access his/her/its phone while wearing the, well, 'phones. I'd happily leave off the mic to leave off the wire, but no one ever asks me. Besides, Bose already makes a wireless Bluetooth headphone, the $250 AE2w; I haven't tried them, but they probably rock. According to Bose press material, the new "FreeStyle" earbuds and the SoundTrue headphones (available in "on-ear" and "around-ear" styles) were conceived of to offer "the best of all worlds: deep and clear audio, superior durability and comfort." And if you're into such things, they're also available in a variety of colors and designs. That said, the AE (around ear) pair Bose sent me to play with are flat black and conventional looking, and that suits me just fine. It's the sound and comfort that matter to me, and the Bose excels in those parameters. Bose says that both the FreeStyle earbuds and SoundTrue headphones feature the company's trademarked TriPort acoustic headphone structure to deliver powerful bass, clear high-frequencies and smooth, full-range reproduction of vocals and instruments. TriPort technology, they say, eliminates the need for artificial bass boosting (stuff like the "loudness" control seen on some audio equipment - stuff that really should be avoided anyway), so music sounds natural and lifelike. This is a good strategy. I'd rather have the phones' sound be transparent - that they reproduce accurately the incoming music without adding or subtracting anything from the original signal - and in my listening tests they did just that. In fact, they sound great. And for a reasonable $150, too! According to Sean Garrett, vice president of the Bose Noise Reduction Technology Group, "We've researched headphone audio for over 30 years for one reason: to offer a better experience." Well, I'm sure profitability enters into the equation somewhere, and that's fine as long as you're offering quality and value, which these do. But apparently Bose is interested in more than just sound (and profitability): "We sweat the details on color, fit and finish, just as we did our audio engineering, to make the SoundTrue headphones and FreeStyle earbuds an extension of you," Garrett said. Makes sense; it's a competitive world out there and there's a lot of stuff that offers "bling" as well as performance. Not only do I love the sound from these headphones, I also love their comfort. Bose uses a nice and soft, padded headband and what they refer to as "memory foam" cushions for the ears. If it's indeed memory foam it's different from the stuff in my Tempur-Pedic mattress because unlike the mattress the phones don't make my ears hot when I'm wearing them - and thank goodness for that! As mentioned, the FreeStyle earbuds and SoundTrue headphones come with an inline microphone/control that lets them work with "most iPhone, iPad and iPod models (note no Android reference here), so you can take a call hands free, as well as switch between calls, music or whatever's on your device, easily. My phone is an Android and I don't use my iPad for music or phoning, so I can't comment on that aspect; I can only assume it works as advertised. I listened to the SoundTrue phones with my Android phone (I don't really care that I can't talk on the phone via them) and with my high end audio system in the big home theater (thanks to a cheap, readily available adapter and OPPO's BDP-105 Audiophile 3D Blu-ray Player, which has its own headphone amp built in) and the sound was great. Bass is nice and tight and the higher frequencies come through beautifully, without sounding the least bit shrill. Remember, of course, that a good pair of headphones or speakers is no cure for a lousy source file; fortunately, I have some great digital files in my collection and this - as well as some of my favorite DVD-Audio, SACD and Blu-ray audio discs, gave me a wonderful opportunity to put the Bose through its paces. As often happens with Bose products, the headphones enjoy being cranked, but crank carefully: loud headphones can really screw up your hearing. Just ask Pete Townshend. Music is what the headphones are all about, but they're aren't just good for that. I do regular radio commentaries from my home office/studio, Skyping into the remote radio stations using MXL's USB.009 microphone to ensure great sound (well, as great as you can get from my voice!) and using the SoundTrues to let me monitor the folk on the other end. They work great for such an application. They also work great when I'm transcribing voice files using Dragon NaturallySpeaking. These are usually files of people I interview for articles and involves spending some serious time under the phones - sometimes a couple of hours - listening to the recording and speaking it back into Dragon for transcription. I still hate doing this, but it's less unpleasant than it used to be thanks to the Bose' comfort. 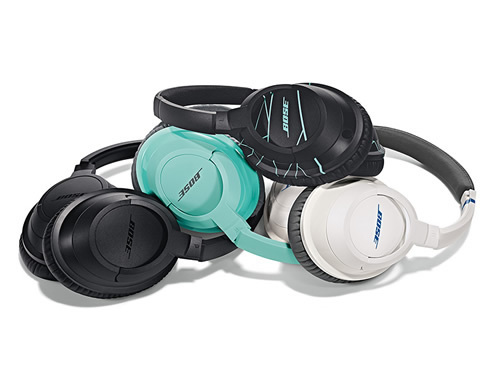 Bose offers the SoundTrue, in Black, White, Mint, and the two-tone designs of Purple/Mint (on-ear only) and Black/Mint (around-ear only). The around-ear headphones also fold flat, Bose says, while the on-ear phones fold up quite nicely; the carrying case is a tad large for my "purse," but fits well into my backpack. On the other hand, if I need phones on the road, I'll take the QC20 noise cancelling ear buds, thank you very much. The FreeStyle Earbuds are available in Indigo and Ice Blue and feature Bose' proprietary StayHear tips (which conform nicely to the shape of your ears) in three sizes. Hydrophobic cloth (which I believe means it has rabies) covers the acoustic ports to resist moisture, and Bose says the cables are constructed to withstand wear and tear. I've been using several Bose products, from the exquisite SoundDock 10 iPod/Bluetooth device system in my living room to a couple of their SoundLink Bluetooth speakers and noise cancelling headphones and have been very satisfied with them. Ditto for some other Bose products I've only reviewed, such as the V35 Lifestyle home theater system, the new SoundTouch family and even the Solo TV sound bar. In each case, the equipment has worked as advertised and offered excellent sound for their usually diminutive size. They also like to be played at pretty high volumes, which I like as well. It appears that Bose has done it again with the SoundTrue headphones. They may not cancel noise, but they sure play music and other stuff well and the over ear version I tried is also one of the most comfortable non-bud phones I've ever used.